The grant pays for three meetings with each class, and a culminating assembly which will be held on June 9 at 2 p.m. at which the classes will present their work and their findings. Each grade is doing a different project. Fifth graders are learning about animal habitations, tracking, animal skulls and dentition. First graders are also learning about animal tracks, bird seed preference, and nesting materials. Hamilton said students discovered mole hills and tunnels, and were encouraged not to step on them. Fourth graders are studying erosion, and took digital photos for their classes. Kindergarteners are working on an engineering standard, and understanding temperature. Watt brought in rubber models of salamanders and frogs, and they talked about how they keep warm through the winter. Both second and third graders are studying plants. In third grade, pairs of students adopted native and non-native plants, and are learning their contrasting biographies. They will also have a digital presentation for their project. Second graders are doing a search for wild plant seeds, and a germination experiment. On Wednesday, Mr. Ted, as he is known affectionately by all the students as they greet him in the halls, was visiting Susan Ayr’s second grade class for their second meeting. The children quickly gathered around Watt in a circle on the floor. “Who can remember some of the parts of the plants?” he asked. One by one they answered leaves, stems, “a leaf that smelled like mustard,” roots, flowers, seeds. “Today, we’re going to learn about seeds,” he said. He explained that they would be collecting seeds from plants to do an experiment with them. They would be putting them in plastics bags with something to make them sprout, and observe them. “Does anyone know what that’s called,” Watt asked. One student answered “germination.” “That’s exactly correct,” he said. Then he asked, when you go to the hardware store and garden store and buy packets of seeds, are they dead or alive? Not sure, he told them the seeds are alive, and asked what they needed to grow. Children answered soil, sun and water. “We’re not going to give our seeds soil, but we will give them water on a paper towel. You’re going to keep them in the class and visit them,” Watt explained. “Don’t you need dirt to make plants?” asked a student. Watt said the seeds will sprout, but they do need dirt to make them grow big. “How can a plant not just spread seeds by falling down,” he asked. “Some have things that eat their seeds then poop out the seeds,” a student named Timmy answered. Their teacher Mrs. Ayr asked them to think about how dandelion seeds spread, and pretended to blow on a dandelion. “They fly away,” several students said. Team pairs then wrote their names on the bags, and put wet paper towels in the bags. Watt asked if they should keep the bags zipped or open. He asked the children to put thumbs up for zipped, down for open, sideways if they were not sure. Thumbs pointed in every direction. He told them seeds need carbon dioxide and oxygen, so the bag should be kept open. He said the students would give them moisture through the towels (not too wet). He then gave instruction on how to collect seeds, and asked each team to find at least four kinds of seeds, and collect five of each. “It’s going to be hard,” said Mr. Ted. “I need you to really be scientists, use your eyes, find what you think are seeds, then we‘ll talk about it.” The students lined up in pairs, and followed Mr. Ted outdoors. They spent an hour collecting seeds – from dandelions, grasses, acorns and pine cones dropped from trees, and flowers. They found a flowering wild garlic mustard plant (the leaves that smell like mustard). Watt also showed them some wild strawberry plants, and told students to leave them untouched to bear red, delicious fruit. 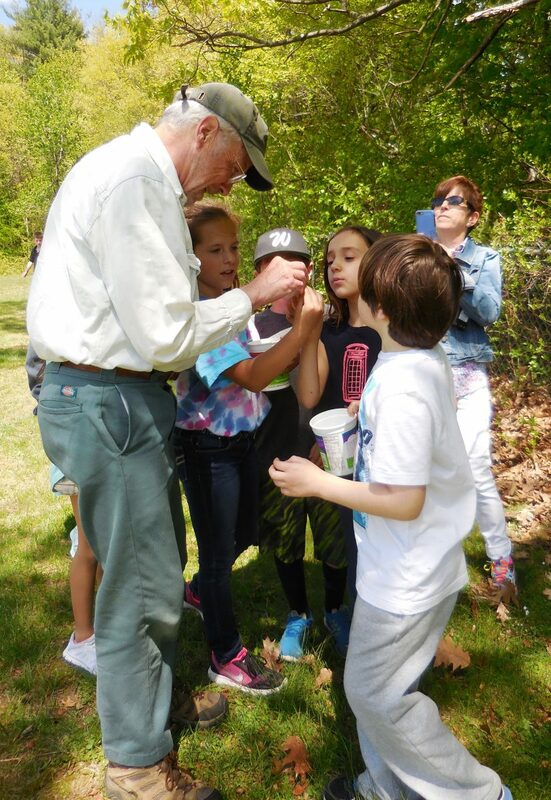 On their own, the students found beetles, worms in acorns, and an ant carrying a large moth wing across a sidewalk. “The kids are so enthusiastic,” said Ayr. Watt will come back to Ayr’s class one more time to check on the progress of the seeds, and discuss the results with the students. The students will also get to share their results with the whole school in the final assembly in June. More information about STARS Residencies and applications are available on the website at www.massculturalcouncil.org. Applications are reviewed in early October, Watt said, and the grant is competitive – first come, first served. Both Hamilton and Watt are already talking about what they might be able to do next year with the students in Russell.